Your service philosophy is on the wall in the entrance foyer, it’s in the newsletter, on the website, and maybe in your email signature. How is that working for you in creating an authentic, living and breathing philosophy for your service? 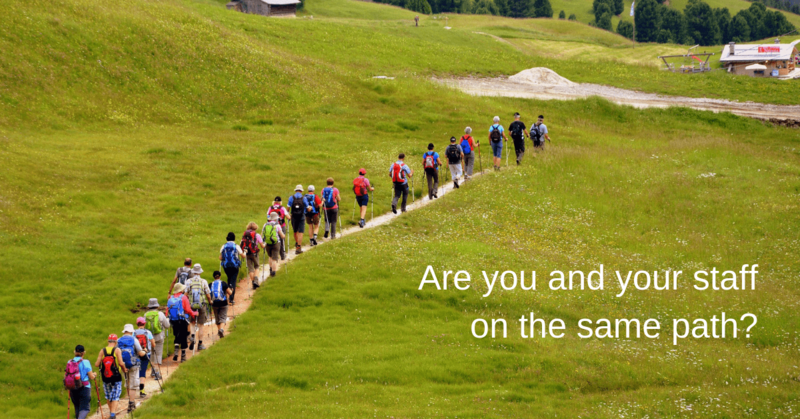 Are all of your staff onboard, understanding and following the path you have set? Perhaps your philosophy needs a recharge. Here’s some tips on how to go about it, thanks to early childhood education consultant Kelly Goodsir. She presented an Educa webinar recently called Building an Authentic Philosophy for your Early Learning Service. Goodsir offers a structure to guide services to explore their current or future philosophy. She also encourages services to have their philosophy in mind when bringing on a new staff member. A philosophy is a theory of attitude that acts as a guiding principle for behaviour, says Goodsir. Much like an overarching idea that’s visible in our everyday practice. “For example, we might say we use play-based learning and might have that concept in our philosophy. But if we explore what it looks like in our program and local context, it might be difficult for some educators to articulate or attach that,” she says. You’re after a statement that connects to your education team. Goodsir suggests starting with a desired quality framework. For instance, in Australia, this would be the National Quality Framework, while in North America it might be values set out by an accreditation agency or QRIS program. From that starting point, you can start exploring your service’s philosophy and what it could be. “Start to brainstorm around the idea of what we believe as educators, then ask what does this mean for what we do,” she says. As a quality validator in the past, Kelly has visited hundreds of services across Australia to examine their philosophy in action. “I saw a lot of general philosophy statements, but I would also know when I walked into a service and read a statement that could also be felt, heard and seen. It is tangible. I’d see it in the minutes of staff meetings, the way educators talked to children, worked with families, ways that were different and unique to the local context. I would always marvel at the commitment these services demonstrated to engage their philosophy on a regular basis and it always showed in their practice. to help anchor your conversations with staff about their own and the service’s philosophy. It’s important to tap into what each staff member brings to the service, their world views, attitudes, knowledge, skills, cultural views, values, beliefs, personal philosophies, their sense of self as an educator and defining moments they’ve had in their career. All this is part of each educator’s ‘bioecology’, as developmental psychologist Bronfenbrenner terms it. Goodsir spoke about her own career-defining moment, when as a 21-year-old, she was being interviewed for a leadership role in early education. “They acknowledged I was a younger leader applying for the role and asked how did I think I’d be able to manage the complexities of management. I said, the best thing I can do as a leader when a scenario presents that I don’t know what to do, is to ask the people around me. It comes back to knowing how to ask the questions,” she says. In a broader sense, that’s about ‘leaning in’ to the experts who’ve done plenty of research in early childhood education. That becomes a platform for educators to “wrestle with our personal point of view and pedagogy”. Services should explore what ECE experts and theorists bring to the field because sometimes our personal viewpoints need to be “left at the door”, says Goodsir. The cog model Goodsir uses as framework for these types of discussions. Just asking people what their personal beliefs and value system are won’t necessarily open the floodgates. That’s why Goodsir suggests asking your team of educators to bring in an artefact or story that represents a value they hold as an educator. Encourage them to talk in small groups about what this means to them and how it influences their practice as an educator. This process of sharing might take your whole meeting. From here you ask each person to identify a value card that reflects their story. Whose are the same? How do these connect to the services values? Ongoing meaningful conversations are more authentic once you have established values. “Share the stories that connect us and value the knowledge and experiences that bring us together as educators,” she says. Goodsir also reminds services to involve children in exploring the philosophy. This means noticing their behaviours and interactions which act as a prompt to reflect on the authenticity of the philosophy. “In one of the services I’ve worked in, it was about really listening to children and their actions. The philosophy stated the value of ‘risky play’ yet we were noticing that children were jumping off furniture and using their physical environment to test their limits and boundaries. We looked at what was available in our environment and realised we had not caught up to what this aspect of our philosophy really meant. Crafting the text of your philosophy is definitely a joint process with your staff. In addition, it makes sense to involve your community for feedback and board of directors, for example. The aim is to make the words relevant to your service’s perspective, beliefs and vision. It should not be early childhood jargon. The words on a page should be the actions and approach of your team. As for the word length of your philosophy, it’s up to your service. However, shorter sentences, active rather than passive voice and simplicity will resonate more with those who use it to drive and inform their practice. Check out some examples from Early Childhood Australia in the links below. Note: you can upload your values or philosophy in Educa and make it available for linking in learning stories and planning. This helps connect your staff and your parents to your service philosophy on a regular basis. So, you’ve nailed your philosophy – in more ways than one. Goodsir says in her own practice she’d review it at least quarterly. “It should be a checkpoint against everything. For example, we’d review it against our decision-making. We found we were spending a lot of money on commercial information technology products, but leaning towards a path of using natural materials and loose parts. We identified a conflict that required more thought,” she says. This anecdote shows why it is important to check in periodically with the philosophy of your service. After all, it should breathe life naturally into what you do every day. Upload your philosophy to Policies – available for printing and sharing with parents or teachers only. Helpful ideas on the business and practice of early childhood education. Is Food Play OK in Early Learning Services?